Burnout among radiologists is no small problem. We ask the experts how to address it. Radiologists, it’s OK to take off your cape. And, administrators, seeing that they do so is in the best interests of your patients and practice. If radiologists keep trying to maintain superhuman standards, both self- and system-imposed, their rate of burnout is bound to skyrocket to an even higher rate. Just ask Stacey Funt, MD, a once-full-time, gone-part-time radiologist who now dedicates part of her career life working on self-care and burnout prevention with medical students, residents, and physicians. “I was once quite sick, but we were very short staffed so I went to work and read films hooked up to an IV. And no one around me thought that was odd,” says the national board-certified health and wellness coach, founder of Lifestyle Health LLC, and clinical instructor in lifestyle medicine at Stony Brook University Medical Center in Stony Brook, New York. Explaining the rationale for the title of their presentation, “Radiologist Burnout: Myth or Reality,” Morgan says there is a misconception that the specialty of radiology is immune to burnout. “Many years ago, this belief was perhaps more closely reflective of a predictable work day and more reasonable lifestyle. But, like the proverbial frog in the pot of—slowly—boiling water, we woke up one day to find ourselves in an intense work environment with complex, competing demands upon our time and energy,” she notes. “Burnout pervades all aspects of a radiologist’s life,” Funt adds. “Of course, it can affect job performance in the quality of reads or procedures, degree of professionalism, communication with clinicians, and dynamics of the work group. But it also affects personal life, including families and friends—and health.” Physicians with burnout have higher rates of depression, alcohol and drug use, suicide ideation, cardiovascular disease, nonspecific symptoms such as gastrointestinal upset and insomnia, and even higher inflammatory biomarkers, she explains. Burnout can also lead to errors, according to the study “Physician Burnout, Well-being, and Work Unit Safety Grades in Relationship to Reported Medical Errors,” recently published in Mayo Clinic Proceedings. It’s possible that errors reported by radiologists reflect the fact that radiology errors may be more identifiable than those in other specialties, notes lead author Daniel S. Tawfik, MD, yet radiologists joined procedural specialists in reporting some of the highest error rates. As to which areas of radiology are hit hardest by burnout, Funt makes some presumptions due to a lack of studies in the area: IR, due to the hours involved and the nature of the work; mammography, due to its high litigation; or general diagnostic imaging, due to prolonged sitting and focus requirements. “Yet, each area has their challenges and experienced many changes over the past decade in expectations and workflow,” she explains, adding that such predictions are difficult to make, since there are many models of practice, even within the same specialty. According to Funt and the other experts consulted by Radiology Today, resources such as mindfulness tapes, schedule adjustments, and a good diet go a long way toward defeating burnout, but what is truly needed is a change in culture. Today’s radiologists read images faster than a speeding bullet, chug through long hours more powerfully than a locomotive, and leap over obstacles that could cause a delay in care—some of which may be dangerous, such as high radiation dose levels. “There is a need to openly acknowledge and confront the ‘Superman’ image that many physicians, including radiologists, have been inculcated with during traditional training throughout medical school and residency training and have adopted as part of our culture. This culture contributes to our denial of the reality of burnout in our profession,” Morgan says. Changing the culture is imperative, says Bryan Bohman, MD. As the Stanford physician who laid the foundation for WellMD, the university’s fully funded and nationally recognized wellness program, Bohman has helped develop numerous strategies to fight burnout. “Physicians, by nature, will make that superhuman effort to provide outstanding patient care, regardless of obstacles, but it can take a toll,” he says. In addition to working at healthy levels, Bohman encourages physicians, including radiologists, to participate in activities outside of work, especially when they can do so with colleagues; these types of activities can help build a sense of community and mutual support. Administrators, he says, can help physicians avoid burnout by working to establish such programs. They can take the lead from the WellMD website, where users can follow a link to an activity of their liking, including groups that write, perform, and play music and others that do physical activities, such as rock climbing, biking, and various sports. Many of the groups originated within the local community, so administrators interested making similar offers should consider contacting groups outside of the hospital and asking radiologists to share the names of groups in which they already participate. The site also features links to numerous counseling and health-oriented programs that serve to keep radiologists healthy, such as screening programs and mindfulness sessions. The WellMD website and the work being done by the center and the newly appointed center director and chief wellness officer, Tait Shanafelt, MD, can serve as a useful resource for administrators. Bohman also has purposeful advice to share with administrators who want to keep their radiologists well. First, organizations should consider surveying their physicians, including radiologists, to determine the prevalence of burnout within each of their departments. They should also consider designating a wellness director within each department, a step WellMD initiated at Stanford. The directors meet each month to discuss wellness issues and compare notes on efforts to reduce workplace stressors. Toward that end, WellMD joins forces with performance improvement leaders who work with the wellness directors to find solutions for issues that are causing inefficiencies and stress within the workplace. “The art and science of medicine has become so complex,” Bohman says. “The work of the radiologist has evolved and is mentally more intense with thousands of images to process,” Lee adds. “Likewise, they have limited control of schedules and turnaround times.” Funt says stress is affected by workflow, productivity metrics, scheduling, department politics, and policies. Attention to workplace/patient safety also is key to reducing burnout, Tawfik says. In his study, participants were asked to self-report their errors, as well as to assign their workplace a safety grade. The physicians who self-reported errors in his study also assigned lower grades to their workplace, suggesting that the error rate may go down if departments can achieve higher safety grades. Yet a physician who is burned out can make errors even in safe environments, he says. For that reason, programs to fight burnout should be two-pronged, he notes. The radiologists who reported being burned out in Tawfik’s study also said they did not have the opportunity to develop longitudinal relationships with their patients. 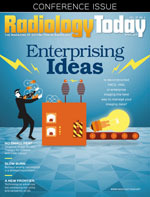 Isolation and disengagement may be the cause for burnout for many radiologists, Funt notes. Sadly, Morgan says she knows experienced radiologists who are resorting to retiring early in an effort to combat burnout. “Some feel little autonomy or control over relentless demands or [little] ability to improve the working conditions; [they] decide to search for meaning and fulfillment outside of work,” she says. Fortunately, Bohman sees that engagement happening. The National Academy of Medicine and the Association of American Medical Colleges now identify burnout as a major problem and are directing resources to address it, he notes.